RainSaucer - Mosquitoes in my Rain Barrel? Mosquitoes in my Rain Barrel? One of the interesting things we learned at the recent ARCA conference is how Mosquitoes can still wind up in rain barrels, even when the lid is tightly secured and filtration is in place. 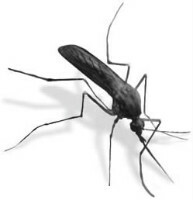 According to the scientists which presented at the conference, all the mosquitos need is a small accessible puddle of water any where along the route to the rain barrel to lay their eggs. Once the miniscule eggs are in place they can easily be washed into the rain barrel with the next rain. The typical example given was of a rain gutter stopped up temporarily creating a breeding ground Just one more reason standalone rainwater harvesting has appeal. It puts you in complete control of the water from the sky to the barrel.